A screening of the films made this and last year by The University of York Filmmaking Society. Happening on Sunday July the 15th 2008, 11AM-1PM, at York City Screen Cinema, Coney Street, York. Think entry is like four quid. I don't know whether it's a good idea to admit to being a student what with lots of students being publicly acknowledged as tosspots, but I am a student, so that's that. The mouth and left eye is mine, the right eye is Rachael's. It's kind of like our baby. The Get Reel trailer version of it can be seen here, other versions I messed around with can be seen here and here. It took a long time to set up, and to be honest I'm not sure it paid off. Especially with the Wonderful Time one, should have filmed it a lot more times from different angles. Overall it looked brilliant in my living room, not so good on film. If I knew anything about motion sensors and selling things to art galleries I'd try and make it a sculpture, then it would kick Andy Warhol's video installation arse at least. I think the issue was that I was trying to politely rip off the style of Joel Veitch and Eclectech, but unlike them I don't have the smarts to combine it with anything else, like an original song or something. Some online folks have compared it to Chris Cunnigham's stuff, and the same thing happened with Cellars. I love Chris Cunnigham, but my response to this should probably be to make something that looks nothing like his films. I've kind of failed at that. 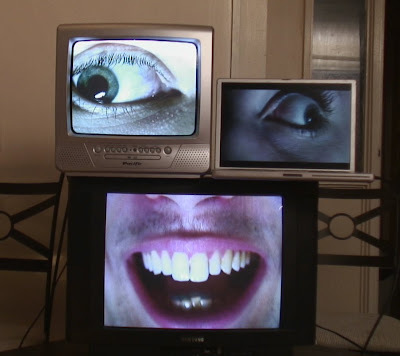 The next thing I've got planned will look more like a cheap, nongood Aphex Twin video knockoff than ever. Seriously, there's even techno music and creepy dancing. However there's one other thing I'm making that maybe won't. DAMMIT reading that back why am I SO self-deprecating ALL THE TIME. I'm going to make another post telling me to stop doing this.